We are Ian and Sarah. We are a fifty something couple from North Yorkshire. For the last few months we have been planning an adventure. Secretly, we’ve been plotting our gap years for ages, inspired by what our daughters have done and thinking of all the places we still want to go and the things we still want to do. Two young hotel managers, both from the north of England, who met whilst working at The Chester Grosvenor Hotel, were plotting over a glass of Champagne. The chat developed into a discussion about the places they wanted to go and adventures they were determined to have. So between them they decided that eventually they wanted to sail a yacht into a spectacular tropical bay, crystal clear sea, white pepper beach, you get the idea, whilst standing on the bow playing a saxophone! At that point neither of them had ever sailed a boat or learnt to play the saxophone! As a testament to the power of dreams, even without the accompanying lists, plans or spreadsheets, the two friends set about developing their careers and almost incidentally achieving, at least in part, some of the dream. Wilhelm Hartl - Personal Pages. Motor cruising on a Trader 535. Skipper's photo reports. Since 2011, in chronological order. 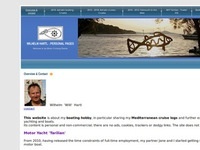 Nick Mines' Hejira web site is an attempt to consolidate previous hosting of location, track, images and the blog history (including the award winning accounts of the Atlantic crossing in November 2015 and BVI to Bermuda in 2016) into a central, easily accessed forum for family, friends and others interested in the adventures of ‘Hejira’ and her crew. 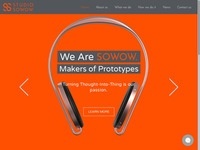 Please feel free to make contact to offer any comments or suggestions which might make our humble efforts more accessible, helpful or interesting. 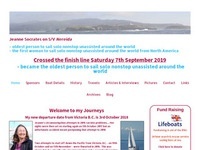 This blog follows the adventures of Jo and Liz on their Westerly Ocenalord, Nimrod of Tamar having left their home port of Portsmouth in 2012. 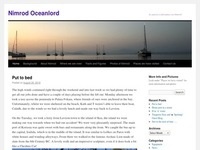 Log of Helen and Andy's voyages on Speedwell of Rhu, an Oyster 435, together with information about Speedwell and a collection of articles on various sailing topics. This is an account of our sailing trip to the Med from the UK. We are on Leg 7 - already exceeding the original 5 year there-and-back plan. 2009 was Plymouth, UK to Portugal via France, Biscay and the Spanish Rias. 2010 it was to Sardinia via Gibraltar, Spain and the Balearics. Next came Sardinia to Corfu via Corsica, Italy, Sicily and Malta. For 2 years we've explored some of Greece, the Ionian, Peloponnese and the Sporades and last year was Turkey. We're back in Greece now to explore the as yet unvisited areas, from Rhodes to Northeast Aegean. 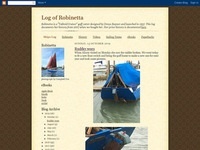 The journal is not specifically a sailing "log" as it was originally intended for family & friends to keep tabs on us. 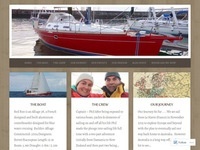 Follow our journey on board Red Roo through this blog and web site as we live aboard and sail full time from Europe back home to Australia in our Alliage 38 yacht. On average we post once a fortnight and in the first three years of our adventure have already sailed and explored 16 countries in Europe. Yes we are taking the long way - there is a whole world out there to sail and explore. First was west-about through Tropics from west coast of Mexico back to Mexico (through Panama Canal), others were east-about, two around Cape Horn. Last one solo, nonstop, unassisted - Guinness World Record for 'oldest female RTW nonstop unassisted'. 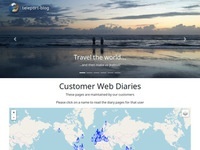 Daily blogs posted to website when underway. Presently in La Cruz de Huanacaxtle, Mexico, recuperating from bad fall on 28 Sept 2017, while 'Nereida' awaits my return to Victoria, B.C., Canada in May, ready to cruise the beautiful Gulf Islands etc of British Columbia. Plan to start a new nonstop unassisted solo RTW early in October 2018 from Victoria Hbr.